We recommend taking the public bus from Dong Hoi to Phong Nha. Unfortunately, you cannot book your bus tickets online. The bus station in Dong Hoi is only a short taxi ride from the railway station. Another advantage is that the bus drops you off at the main street in Phong Nha. The pickup point of this local bus is at the OPPOSITE of central bus station ‘Ben Xe Nam Ly’. This bus station is a 15 min walk from the central railway station or a short taxi ride for just 25.000 VND (€0,90). The bus to Phong Nha costs 35.000 VND (€1,30) and takes about 1,5 hour. Take the green and yellow colored bus with number B4. 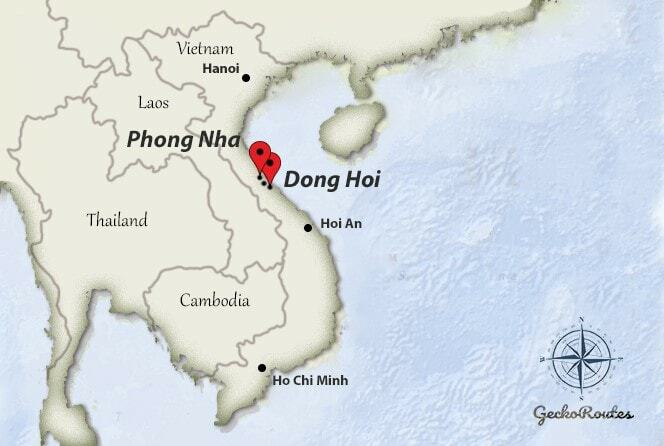 It has ‘Dong Hoi – Hoan Lao – Phong Nha’ on the front. Departure times from Dong Hoi to Phong Nha are 5:30, 5:45, 7:10, 8:00, 9:00, 10:00, 11:00, 13:00, 14:00, 15:00, 16:00 and 17:00. When traveling from Phong Nha to Dong Hoi, you can catch the bus from the main street in Phong Nha. Check with your accommodation if there are any changes to the bus schedule and ask for the exact location of the pick up. Departure times from Phong Nha to Dong Hoi are 5:30, 6:00, 7:10, 8:10, 9:10, 10:10, 11:10, 13:10, 14:10, 15:10, 16:10, 17:05. Want more comfort? Then taking the taxi will be your best option. You can find a taxi at the railway station for about 400.000 to 500.000 VND (€15-€19) to Phong Nha. Don’t forget to negotiate since they will try to charge you more! Dong Hoi Airport is a 15-minute taxi ride from the bus station where you can catch the local bus. This is an extra 15min taxi ride in the opposite direction, what will make the total journey even longer. It is much easier to take a taxi from the airport to Phong Nha. Expect to pay around 500.000 VND (€19) from the airport to Phong Nha. You can also check with your accommodation if they provide pick-up service. Thanks to the great hospitality of the family, this homestay will feel like your home. After a day of trekking you can take a dive in the pool or sit back and relax with a Netflix movie. The homestay is located right in front of the bus stop in the center of Phong Nha. Rooms with mountain views already start from €19,- including an outstanding breakfast! Bonus: Free cancellation policy till the last day! Want a more unique experience? The interior of Phong Nha Rustic Home creates a real rustic feel which makes you feel one with nature. It's located outside the city center, but you can use their free-bicycle rental to explore the National Parks or get to the center. Rooms start from €22. Hello Patrice, Sorry to hear you have been waiting for the bus. I double checked my sources, but I haven’t heard about any update on the schedule. However, delays in Vietnam are not uncommon and it happens from time to time that you have to wait for 30min-1hr. In case there is a new bus schedule, I would love to see the new schedule. Any chance you have a picture of this?